Beautiful certificate recognizing the Centennial of the Homestead Law issued in 1962. 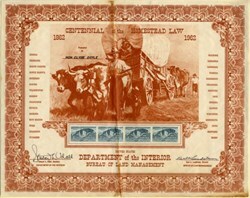 This historic document was printed by Department of the Interior Bureau of Land Management and has an ornate border around it with a vignette of a covered wagon driven by cattle with a family out on the range. This item has the signatures of the Department of Interior Secretary, Stewart L. Udall and the Bureau of Land Management Secretary, Karl S Landstrom. 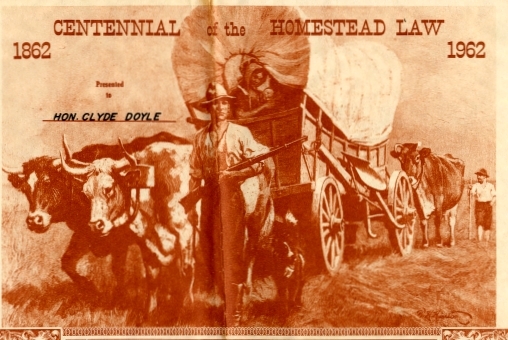 The certificate has four uncancelled 4 Cent Homestead Act Postage Stamps attached to the face. The certificate was issued to Hon. Clyde Doyle and is over 54 years old. Fold and small split on top and bottom on fold. The Homestead Act was a United States Federal law that gave freehold title to 160 acres (one quarter section or about 65 hectares) of undeveloped land outside of the original 13 colonies. The new law required three steps: file an application, improve the land, and file for deed of title. Anyone, including freed slaves, who had never taken up arms against the U.S. Government could file an application and improvements to a local land office. The Act was signed into law by President Abraham Lincoln on May 20, 1862. Eventually 1.6 million homesteads were granted and 270 million acres were privatized between 1862 and 1964, a total of 10% of all lands in the United States. Stewart Lee Udall (born January 31, 1920) is a former American politician. Born in St. Johns, Arizona, he is the son of Levi Stewart Udall. He was educated at the University of Arizona, and he saw combat as a gunner in the Army Air Corps during the Italian Campaign of World War II. Stewart Udall graduated from the University of Arizona Law School in 1948, and began his own law practice in Tucson shortly thereafter. Udall became increasingly active in public service, being elected to the School Board of Amphitheater Public Schools (District 10) in Tucson in June 1951. He became the President of Amphitheater School Board in 1952. Stewart Udall served as U.S. Representative from Arizona from 1955 to 1961 and then as Secretary of the Interior under Presidents John F. Kennedy and Lyndon B. Johnson from 1961 to 1969, when he described his nation's ecological attitudes as the "myth of superabundance". Udall was largely responsible for the enactment of environmental laws in Johnson's Great Society legislative agenda, including the Clear Air, Water Quality and Clean Water Restoration Acts and Amendments, the Wilderness Act of 1964, the Endangered Species Preservation Act of 1966, the Land and Water Conservation [Fund] Act of 1965, the Solid Waste Disposal Act of 1965, the National Trail System Act of 1968, and Wild and Scenic Rivers Act of 1968. He was the brother of Congressman and 1976 presidential candidate Mo Udall; he served as Mo's campaign manager during the primary election, which Mo lost to Jimmy Carter. Stewart's son Tom Udall and nephew Mark Udall are currently serving in the U.S. House of Representatives. Point Udall, the easternmost place in the United States, was named for him. He is the author of numerous books, including his most well known, The Quiet Crisis, published in 1963. In 1968 Udall received an LL.D. from Bates College. Udall, along with Robert McNamara and W. Willard Wirtz are the only three surviving members of the Kennedy administration cabinet. Clyde Gilman Doyle (July 11, 1887 - March 14, 1963) was a United States Representative from California. He was born in Oakland, Alameda County, California. He attended public schools in Oakland, Seattle, Washington, Los Angeles and Long Beach, California. He graduated from the College of Law of the University of Southern California at Los Angeles in 1917. He was admitted to the bar in 1916 and commenced practice in Long Beach, California. He was a member and president of the Board of Freeholders, Long Beach, California in 1921 and 1922. Doyle was a member of the California State Board of Education. He was elected as a Democrat to the Seventy-ninth Congress (January 3, 1945 - January 3, 1947). He was unsuccessful candidate for reelection in 1946 to the Eightieth Congress. He was elected to the Eighty-first and to the seven succeeding Congresses and served from January 3, 1949, until his death in Arlington, Virginia on March 14, 1963.